I thought I was on drugs. Not that I knew what being on drugs was like, you understand. I was, after all, a pretty clean-cut, mostly-normal, teenager spending a fairly-uneventful summer bumming around Europe: London, Paris, Berlin, Amsterdam, Athens, and so on in no particular order. Then I turned a corner in Barcelona -- and was sure someone at the hostel the night before had slipped me something. What other explanation was there? A building was melting for God's sake! The rest of the street was Spanish normal: warm brick facings, black toothed iron railings, arched windows, bursts of flowers on balconies, but right in the middle of average, of ordinary, of common, of commonplace was a building that sagged, that drooped, that arched, that ... well, that looked like it had been designed with vines and leaves in an orchard instead of with a T-square in a boxy office, planted from a seed and cultivated instead of having been mathematically assembled brick by stone cold brick. 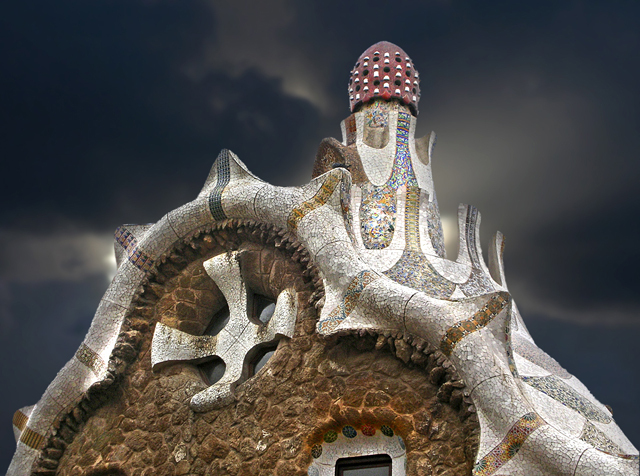 I'd heard of Antoni Gaudí, of course, but for some strange reason I either hadn't made the connection between the eccentric architect and his hometown, or, more than likely, hadn't a clue how brain-throbbingly amazing his work was. But, drugs or no drugs, standing slack-jawed in front of the flowing glory of Casa Batlló on 43 Passeig de Gràcia, I decided I'd spend the next few days seeing as much Gaudí genius as I could. "A Nut, or a Genius?" 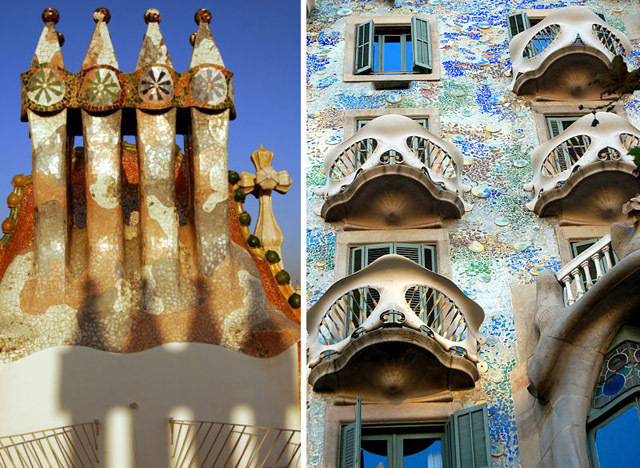 Barcelona has become Gaudí's city, which is ironic since Gaudí didn’t start out as the city’s cultural icon. Far from it: for a long time his only real supporter was the very-rich Eusebi Güell. 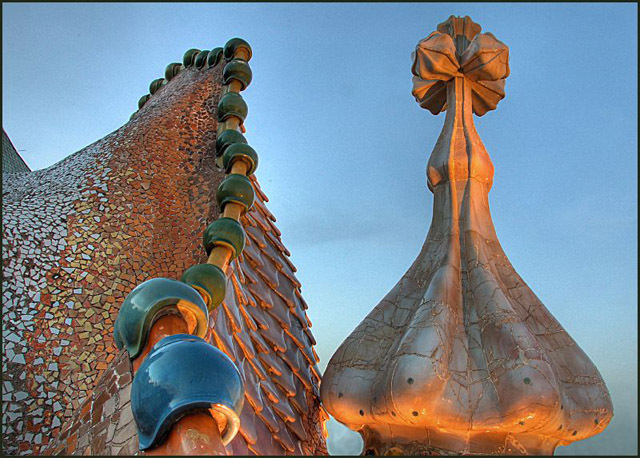 It was only much later that the city, and Gaudí's critics, finally began to understand what he was doing. 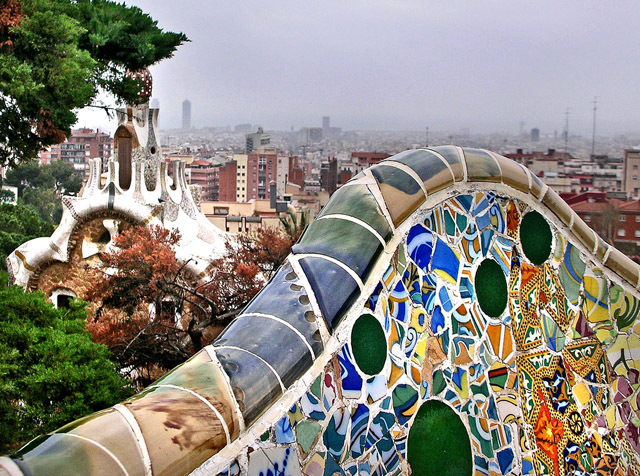 Just look at his Park Güell (named after you know who), just a short walk from Casa Batlló, up on el Carmel hill: everything in the park … flows -- like the concrete he used had been trapped, mid-liquid, as it cascaded down toward the city. Benches are part of fountains which are part of walls which are part of stairs which are part of terraces which are part of columns -- Güell created a run-on architectural dream, an organically shaped wonderland for the city. 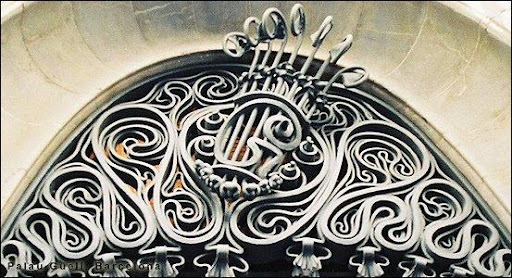 Before continuing in my footsteps, here’s a bit more about Gaudí: an average student at the Escola Tècnica Superior d'Arquitectura in Barcelona, supposedly his instructor signed his architecture diploma saying "Who knows if we have given this diploma to a nut or to a genius. Time will tell." While time certainly did tell, Gaudí at first didn’t have an easy time of it. 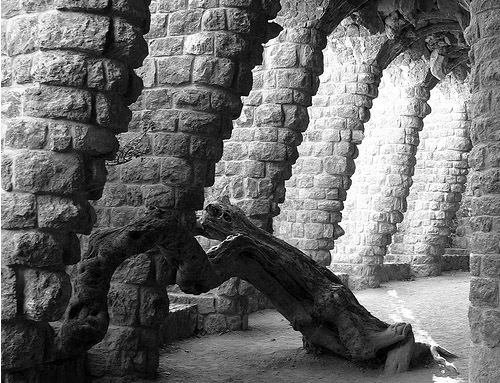 Fortunately for the world, Güell took those early risks with the eccentric architect and gave Gaudí a chance to put into reality the brilliance growing in his mind. 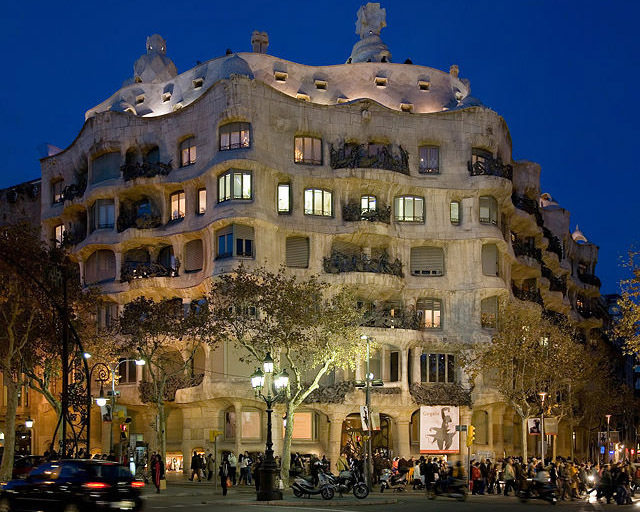 Just look at his Casa Milà (aka La Pedrera): nothing about it looks assembled, or built. 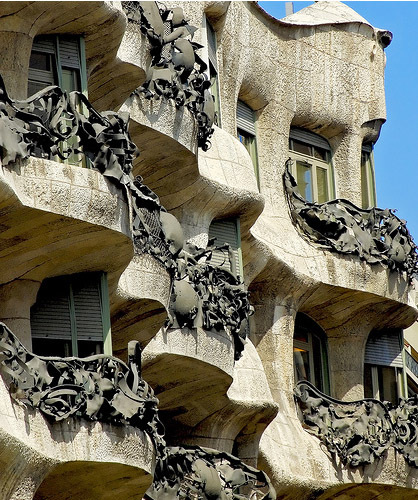 Instead it looks like Gaudí plopped it there as a huge mountain of slippery clay then dug his thumbs and fingers into it to make windows, doors, balconies, and even chimneys. There’s one very important detail I left out of my very short bio of Gaudí. To fill that in let’s go back in time to when his Park Güell was finished: the men are dapper in their black suits and high waistcoats, the women are splendid in their flowing skirts and elaborate hats, and the streets flow with horses (because automobile hasn’t been invented yet). Sure, green is on everyone’s lips today, but Gaudí was creating mad masterpieces of organic shapes, living forms, and natural contours starting in 1883; Park Güell was finished in 1907. One more stop, one more building -- even though Gaudí has grown lots more in Barcelona. Believe me, though, this one is worth the wait. 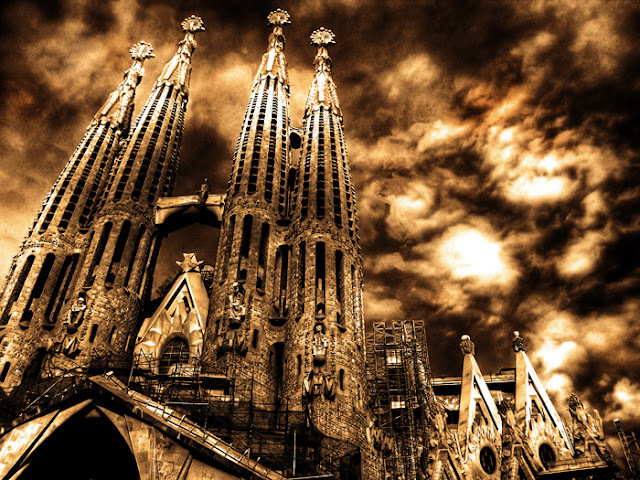 By the time he began working on the Temple Expiatori de la Sagrada Família, Gaudí was a legend but by his 40th year of working on it, both Barcelona and Gaudí had fallen on hard times. 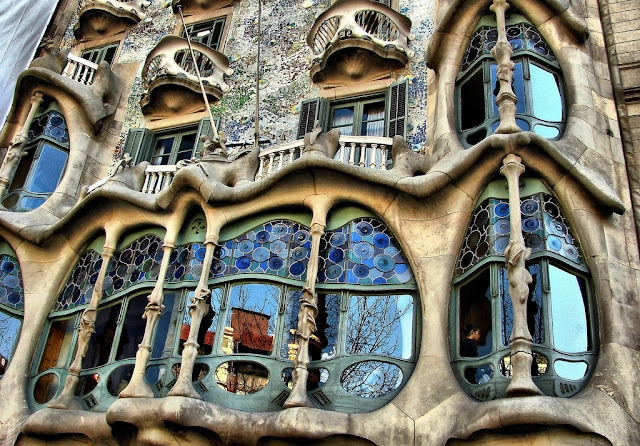 According to some, Gaudí had grown so eccentric, so raggedy, that cabs refused to pick him up, assuming he was a tramp. Gaudí never saw the Sagrada Família finished. In fact no one has because, to this day, it’s still a work in progress. When Gaudí died in 1926, after being hit by a streetcar no less, the Sagrada Família had only just begun to show its potential. There’s only one way to describe the Sagrada Família, what was to be -- and one day will be -- Gaudí’s masterpiece: it’s a cathedral. 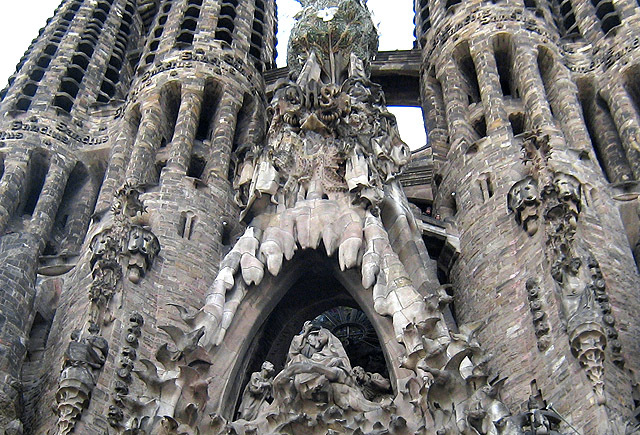 Sitting in the center of Barcelona, the Sagrada Família is a drip-sand castle, a towering bone-ribbed, seashell-vaulted, tower 170 meters tall (about 500 feet for us Americans). 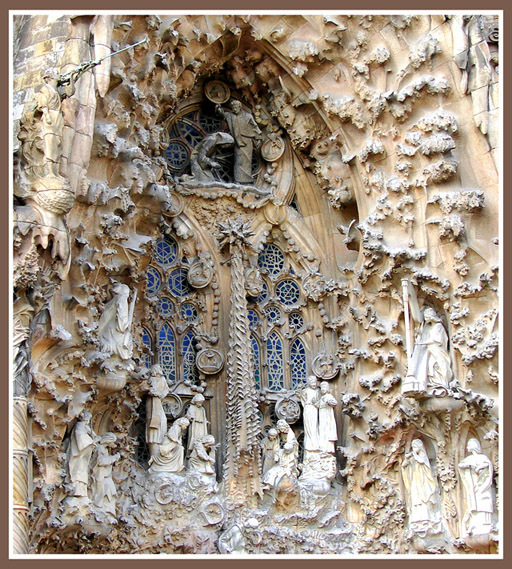 An ardent Catholic, Gaudí envisioned his cathedral to be his final statement, a perfect combination of natural shapes with inorganic materials, a crowing celebration of the beauty of living things. 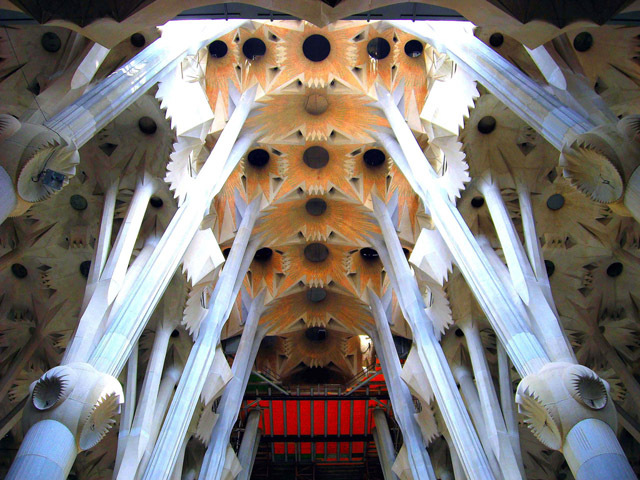 Here is a great photo set, showing how the Sagrada Familia looks inside. It’s amazing to realize Gaudí did what he did at the turn of the last century, but it’s absolutely stunning when you realize that this architect’s masterpiece, if all goes as planned, will be finished in 2026. I wait for my bus every day staring at the Casa Batlló, I guess I am privileged. I envy you Mr Blonde! Unfortunately I am on the other side of the world, but at the end of the year I hope to head over to Spain, with the sole intention of seeing Gaudi's buildings. I have been obsessed with his work since I was about 12, borrowing whatever books on his work I could find. I particularly like his drawings, they are awe inspiring, and if anyone has any resource on his drawings, I would love to hear about it! when standing on the corner in front of the Casa Milà, be sure to take the LEFT entrance to enter it. The right one lead me and my friends just through the first floor, where we saw drawings from Gaudi and others of his time. The other one lead through all the other floors. A great post in a wonderful blog. Thanks you very much, and best wishes from a catalan. A fine post, well written, well shot. This makes me interested in going to Barcelona- some place which wasn't on my high list, until now. 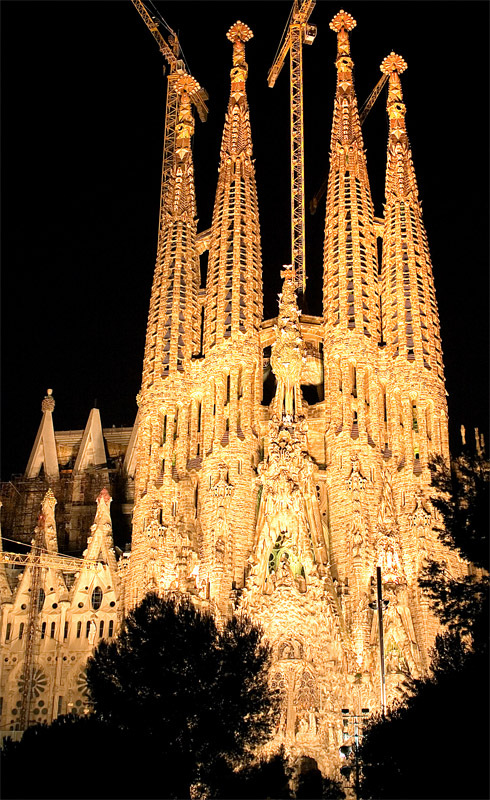 I think Gaudi's Cathedral was in art the inspiration fro Thailand's top artist to build the Buddhist Temple shown here. Gaudi changed my mind about architecture. 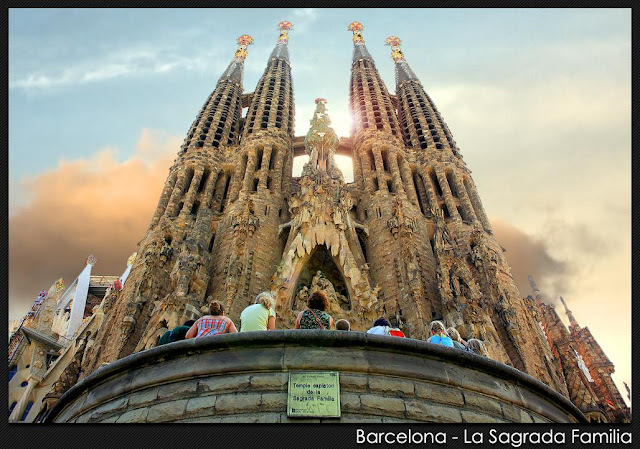 Barcelona is an amazingly vibrant city with its design and the Sagrada Familia and Parc Guell are amazing feats. 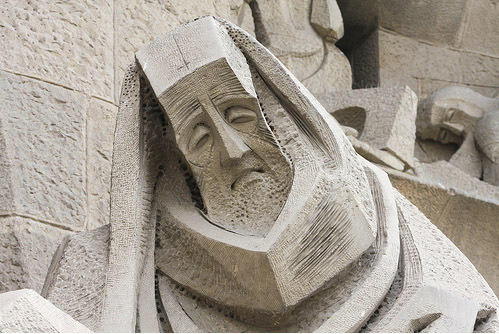 The picture of the angular, sorrowful figure is part of the Passion Facade of the Sagrada Familia. This group of sculptures was designed after Gaudi's death by Josep Subirachs, and differs radically in style from everything else there. It's absolutely stunning in person! Here are some pictures from the artists site. An excellent post, good one. You rendered exceptionally well Catalan names (and you have not used Spanish equivalents). Beautiful and unusual architecture. It's unfortunate that such organic shapes cannot be built as economically as rectangular buildings. That's why you see so few of the former and so many of the latter. That probably also accounts for the fact that construction of the cathedral has taken so long. But the result is undeniably impressive. Something about that cathedral makes me unfomfortable; it has a vaguely Lovecraftian look to it. As an aside, the first time I did LSD I saw a grocery store melt; it swelled up like a burning marshmallow, then collapsed into a liquid state. long time browser, first time comment - great post, love the site, so full of useful knowledge and interesting facts - i would almost say that Gaudi himself may have participated in some form of lysergic acid diethylamide; fore the images of his cathedral and earlier works screams of a psychotic nature. beautiful work, IMHO. Great post and hard to believe that it's even more magical in person. Thanks for always taking us to amazing places! Great post. I really enjoyed readng it. Fell onto this page and loved your views, I was in Barcelona 3 Christmas's ago and made a beeline for the Catherdral.It is truely a work of Genius, the basement has a Museum and explains well Gaudi's design theories.He used a tree as the form for spreading weight downwards to 1 slender column.I bought the biggest book on Gaudi and read it before I returned to London,My son has been inspired by Gaudi to study to become An Architect! Paul Smyth - thank you - really inspiring architecture is like music sculpted in stone. 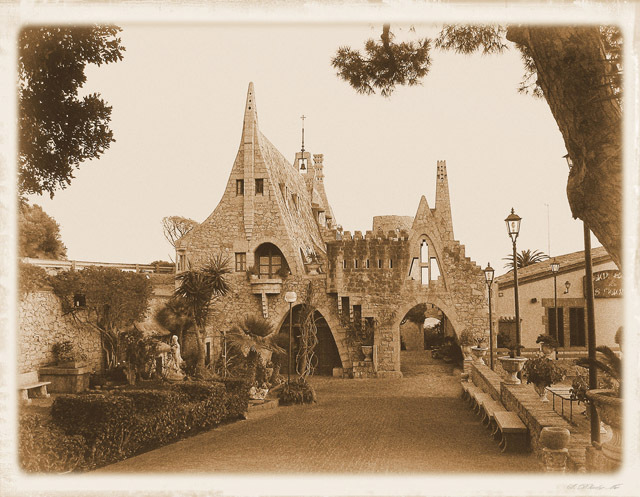 The sepia picture associated with Parc Güell is not there but in the small coastal town of Garraf, 20 miles from Barcelona, right here. 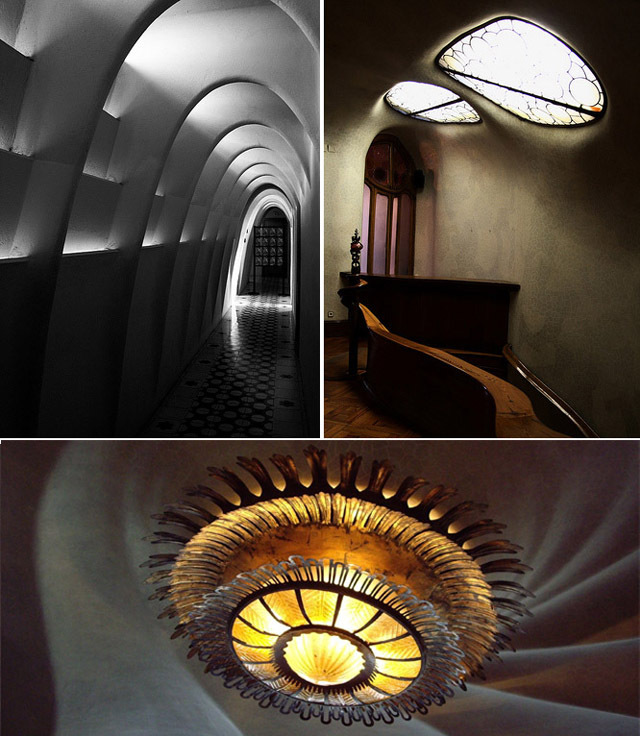 It's worth mentioning that "La Pedrera", the informal name of the Casa Milla, means "The Quarry". 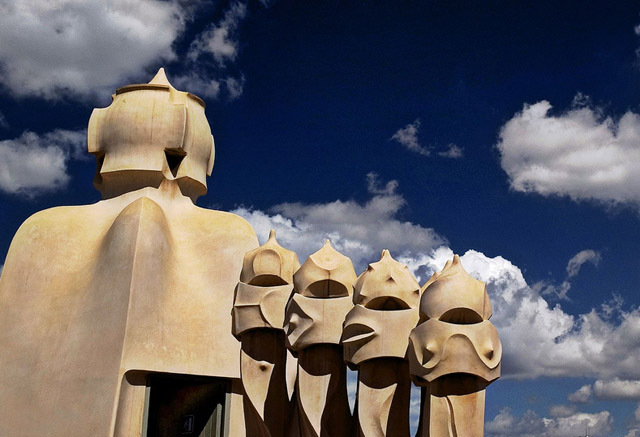 I would add to the comment by Anonymous that the work by Subirachs on the Sagrada Familia should not even be part of it and that it would be better to exclude images of his disgraceful insult to Gaudi's work.